Since the economic collapse in 2008 successive governments have argued that there is a need to cut national and local budgets of government. It has been argued this is a political decision, and not an economic one. Either way the economic crisis is being used to roll back social provision and services to communities. Decisions of public authorities – whether they be national government, local government, or indeed organisations carrying out a public function can be challenged in the High Court by way of judicial review. This process provides a way in which legislative and executive decisions can be reviewed by judges to ensure that they are lawful. A judicial review is a vehicle that allows public authorities to be held to account, and provides a check to ensure that they do not go beyond the powers given to them by parliament and that those powers are not abused. 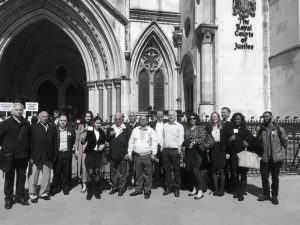 In the past the Courts have not been enthusiastic in involving themselves in such anti-cuts / ant-austerity challenges and have been unwilling to be seen to be meddling in the decisions of elected representatives or be seen for instance as breaching the principle of parliamentary sovereignty. However, increasingly judges have been more willing to hold local and national government to account.The courts have for instance been willing to protect fundamental rights in a number of key judgements. There is no doubt that the Courts have been strengthened by the introduction of the Human Rights Act in 2000, which prohibits public authorities from breaching fundamental rights. A campaigning strategy and a legal strategy – what to do. Increasingly local campaigners are seeking to use a legal challenge as part of their overall strategy to stop cuts in libraries, care homes, and youth clubs for instance. It is something that the Public Interest Law Centre are experts in helping develop. To challenge a decision by a public body there are some legal hurdles to overcome. Firstly, the decision that is to be challenged must have been made by a public authority. So, a local council is a public body, so is a government ministry, where as something like the Football Association is not. Secondly, the decision that you wish to challenge must be done promptly. Generally the time limit is three months, but some decisions it may even be sooner. The Court is strict when enforcing that rule, so don’t delay! Thirdly, you must have ‘standing‘ – simply put you must have ‘sufficient interest’ in the decision you wish to challenge. So a person who wants to challenge the closure of their local library for instance, should show that they actually use that library. It is important to remember that it is not just individuals who can challenge a decision of a public body, community campaigns and organisations can do so. So, once we have the Judicial Review all set to go, there are three broad areas on which to base a challenge:The decision was illegal – this usually means that the the public body making the decision has acted beyond the powers granted to it by parliament, or has misunderstood the law. The decision was irrational – so not only was the decision unreasonable, but it was beyond the pale! The decision must be so bad that no sensible person who looked at the facts and issues could make such a decision. The decision could also be disproportionate to the end sought, usually in the context of human rights or European Community law. The decision was procedurally unfair. A common challenge would be that the public consultation on, for example the closure of a community centre, was completely inadequate. So, if you are facing a library closure, a care home closure, a council house sell off, and the local authority won’t change its mind – maybe as part of the community campaign a legal challenge may be part of your overall campaigning strategy.